Welcome to Release Day at Taylored Expressions! Woohoo!!! There are so many amazing stamps and gorgeous dies available - seriously - every release I am blown away by the absolute wowness of it all - especially this release - so so so so many possibilities !! 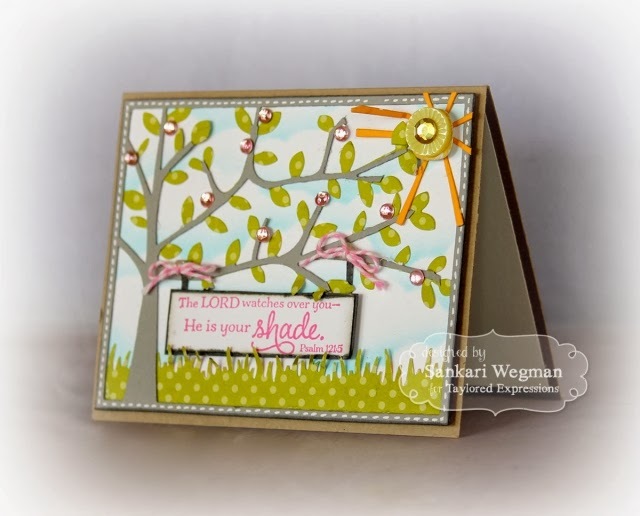 For today's project, I made a card using the Shade Tree Scripture stamp set with the Shade Tree Cutting Plate. There are so many lovely uplifting scripture sentiments in this set - perfect to send a little upliftment to someone who might be down! 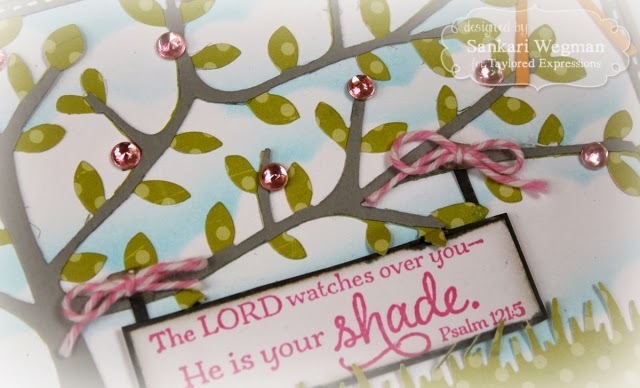 I love the sentiment "The Lord watches over you, He is your shade" - such a beautiful sweet sentiment - makes you feel taken care of, even when things feel overwhelming. I die cut the tree twice - one with brown cardstock and the second with green cardstock and then placed the brown over the green (after cutting the leaves off the brown) and then added it to a sky that I created using the Cloud Border die and then added some pink bling to the leaves for some flowers - so much fun!!! I finished it off by adding the sentiment to a panel that I then "hung" on the branches with some twine. I can't wait to see what all the lovely ladies have created with this amazing release - please hop with me and check them out! Truly gorgeous card Sankari! Thanks for always inspiring me.